Did I buy it more than once? : Not yet but I plan to. How long did 1 purchase last? : About 2 months (used on face, neck, upper chest and arms nearly every day). 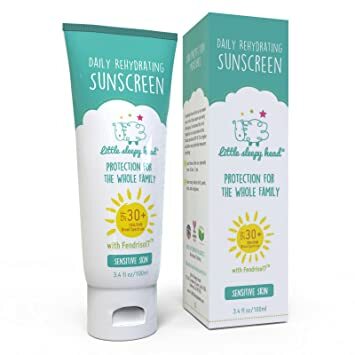 A gentle sunscreen product safe enough for the whole family from age 6 months and up. It provides SPF 30+ (UVA/UVB). It’s safe for very sensitive skin and is well tolerated by rosacea sufferers as well as people with other skin conditions like lupus and acne. It’s not tested on animals (cruelty free), tear free, non-irritating, paraben free, contains no nanoparticles, no PABA, no artificial fragrances, and pthalate free. This is a hypoallergenic formula. Active Ingredients: Octinoxate (7.5%), Homosalate (6%), Octisalate (5%), and Avobenzone (3%). Inactive Ingredients: Water (aqua), C12-15 alkyl benzoate, glyceryl stearate, PEG-100 stearate, phenoxyethanol, aminomethyl propanol, acrylates/C10-30 alkyl acrylate crosspolymer, caprylyl glycol, hydrolized manihot esculenta tuber extract, ethylhexylglycerin, carbomer, hexylene glycol, hydroxypropyl methylcellulose, camellia sinensis (green tea) leaf extract, disodium EDTA, hydrolyzed myrtus communis leaf extract, carica papaya (papaya) fruit extract, lindera strychnifolia root extract, orchis morio flower extract, punica granatum fruit extract, glycerin, chlorphenesin, benzoic acid, sorbic acid, and EDTA. Next What Causes Rosacea and What Cures It? Dear Julie you are Magnificent(how Anita Moorjani likes to say it). It is so hard for me to belive after trying myself so many products for Rosacea that there still are some hopes for Rosceans. Keep up the good work. You look amazing. God to help me to be better and better and I cant wait to read your books.